The aim of the Trends Chart is to provide a progress report over time in the form of a line graph. This information is extremely useful for managers to see whether their teams are improving over time. 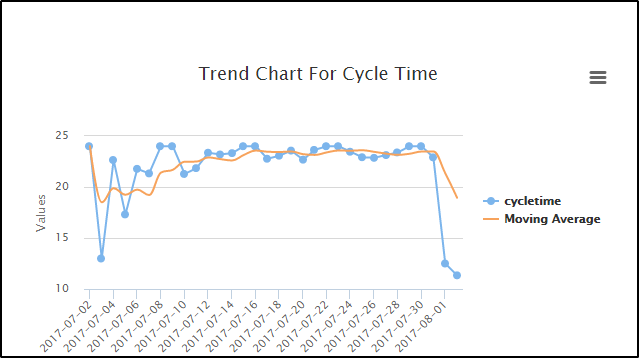 The Trends Chart shows total/average time for cycle time, block time, logged time aggregated by day/week/month/year. As a rule of thumb, average Cycle Time and average Block Time should be decreasing, but if they are going up, this will be an indication for you to look for the root causes. From the filter panel at the left side of the chart, you can define the range of time you would like the new Trends Chart to focus on from your process. 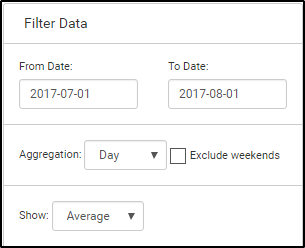 From "Aggregation" you can select to monitor the results on daily, weekly, monthly, or annually basis, depending on your project. Weekends can be excluded from the report by ticking the check-box. 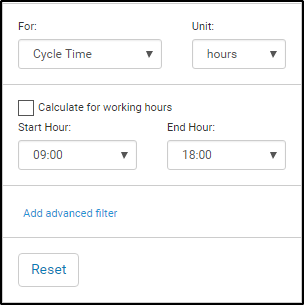 You can select the Trends Chart to measure Cycle Time, Blocked Time or Logged Time. Tip: You can get the most out of visualizing the results per cell of the board or per column to figure out whether you’re hitting your targets and what is slowing down in your workflow. Changing the units means you can visualize the individual values that make up the data in days, hours, minutes and seconds based on your preference. Select columns and swimlanes for which data will be aggregated. 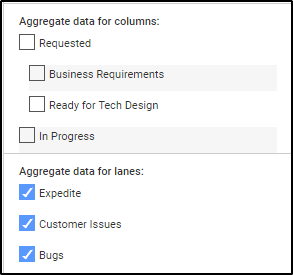 Remove or add any swimlanes and columns by using the checkbox board options and control what data you see. You can download the results of your report in Excel format using the Download button at the bottom right side of the chart. Note: The settings of a particular Trends Chart will bе preserved automatically so you don’t have to configure the same search every time you enter the Trends tab in Analytics.